Members of the first Tri-M Music Honor Society group in at least 30 years pose for a photo on stage. 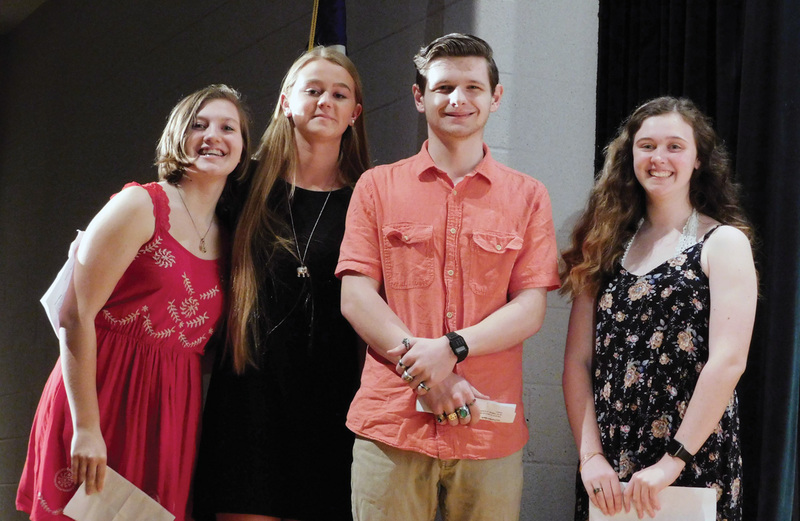 Tri-M Music Honor Society officers include Alexis Landrie (secretary/historian), Amber Hills (treasurer), Frederick Stinglin (vice president) and Kathleen Carter (president). 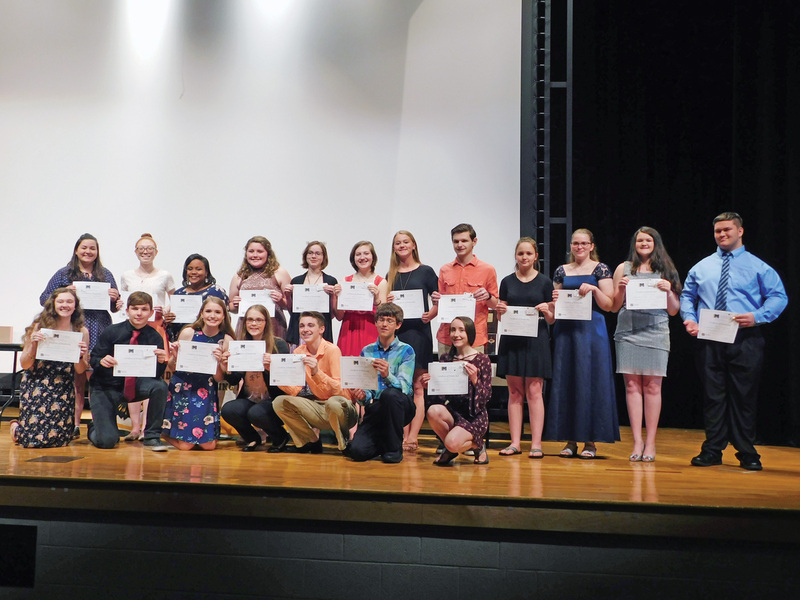 Students who go excel academically and musically have a new opportunity to celebrate that work at Indian River High School, with the rebirth of their Tri-M Music Honor Society. Although inactive for at least 30 years, the IR chapter is intended to inspire passion for music leadership, education and service. This May, 19 students were inducted based on their scholarship, character, leadership and service. IR now houses the only active Tri-M chapter in Sussex County. Formerly known as Modern Music Masters, the Tri-M is found in all 50 states, serving grades 6 to 12. Around the start of the new year, the IRHS Band Boosters were inspired to kickstart the group when one of the parents heard from a band parent at another school. A friend noticed how involved Shari Kerr’s daughter was in IR’s music program and mentioned Tri-M as a great group (and résumé-booster). Since teachers already have enough on their plates, she said, Kerr and the boosters did the legwork in researching Tri-M. They were surprised to learn IR already had a charter, in the 1980s, that had gone defunct. So now, IR only needed to reactivate the program, rather than request a whole new chapter. First, music directors Nathan Mohler and Chantalle Ashford identified prospective candidates, who were permitted to apply. They were judged based on their application, essay and a musical performance. Ideally, the honor society students will perform musical-based community service, such as performing free concerts in public or nursing homes, or tutoring fifth-graders new to band or chorus. Students must also maintain a minimum GPA to remain eligible. The students will begin when the new school year begins. When they graduate, members will wear a special pink cord with their graduation robes. The 2018 seniors were not invited to take part in the honor, although it is a lifetime membership. “I wouldn’t say that we were trying to exclude them. It just seemed like at this juncture it would be a moot point,” since they wouldn’t be able to participate significantly before graduating, Kerr said. The first Tri-M executive officers are juniors Kathleen Carter (president), Frederick Stinglin (vice president), Amber Hills (treasurer) and Alexis Landrie (secretary/historian). For this first year, the adult selection committee chose the officers, but in future, students will choose their own leaders. More details are online at www.musichonors.com.